We provide comprehensive pediatric services with a focus on wellness and prevention. We work with families to instill healthy behaviors to avoid illness. However, should illness arise, we are fully equipped to handle acute needs and work with specialists as needed. We believe that education is an important part of parenting, and we provide guidance and medical evidence so parents can make informed decisions about their child's health. As parents ourselves, we know that parenting is life's greatest challenge and greatest joy! Dr. Blythe is consistently recognized by her peers to the "The Best Doctors" list. She is also an assistant professor of pediatrics at Washington University School of Medicine. Dr. Blythe says, "I love what I do! Caring for children is a challenge and a privilege." 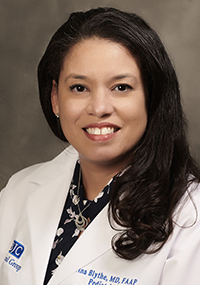 Dr. Blythe's practice is part of BJC Medical Group of Missouri. BJC Medical Group is a well-established, multi-specialty physician group. Does My Child Have Summer Allergies?